A review requested by Ben Verschoor, with thanks for contributing to the Second Quinquennial Antagony & Ecstasy ACS Fundraiser. 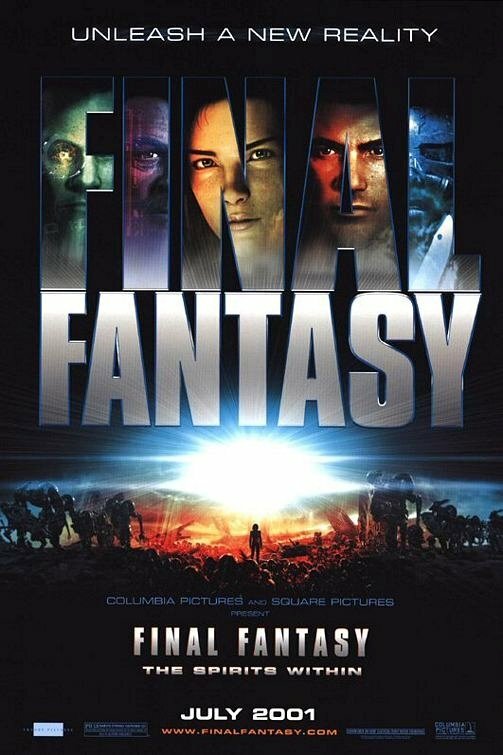 The 2001 video game adaptation Final Fantasy: The Spirits Within is a bad movie. I apologise for the redundancy. But it's not just bad, the way that other entries in its peculiarly benighted subgenre are, like Lara Croft: Tomb Raider or BloodRayne. Or Street Fighter or Wing Commander. Or Super Mario Bros. It is a bad film that swings between the inordinately awful, the merely crummy, and even the genuinely good in a wild confusion. We cannot, for example, bluntly declare "it's an ugly movie", even though its ugliness is pervasive and surely the individually most important reason that it's also bad. Parts of it are as beautifully-designed and executed as anything in an animated feature from the 2000s. And the only reason it's so damn ugly is because it's so damn ambitious. The thing about The Spirits Within - which has absolutely no connection to the nine games in the main Final Fantasy series (Final Fantasy X released just over a week after the film opened), nor any of that series' spin-offs, except for a character called Sid (though its spelled "Cid" in the English localisations of the games) - is that it was as much a proof of concept and technical exercise as it was an attempt to make a narrative film. The idea behind it was to make the first photo-realistic CGI humans in feature-length cinema, six years after Toy Story birthed the fully-rendered CG feature by including hideous deformities where its human characters should have gone. Actually, that's much too small a way of putting the film's ambitions: The Spirits Within was meant to create a whole new paradigm in movie acting, creating in its main character a CG "actress" who would show up in film after film, both live-action and animated, who would come to feel like a real movie star in her own right. This did not come even close to happening, and most of the aesthetic technique that The Spirits Within pioneered turned out to be an immediate dead end. The film was a big flop, one that shuttered the new film division of video game publisher Square almost in the same breath that it opened it, and very nearly wrecked the company's planned merger with fellow software company Enix, now wary of linking its fortunes to company with such a high-profile failure. Worse still, the much-ballyhooed new style was a complete wash: The Spirits Within is a handsome movie in almost every way except for its photorealistic characters, who remain 14 years later the leading citizens of the Uncanny Valley, that place where the visually accurate representation of humans runs into the barely-not-right animation of their bodies and features, and gives everybody watching a screaming case of the heebie-jeebies. Far from triggering a new generation of computer-generated movie stars, The Spirits Within decisively proved that all-CG characters had better stay in the realm of pure fantasy, like the frog-man Jar-Jar Binks of Star Wars: Episode I - The Phantom Menace, or better still, the skeletal subhuman Gollum of The Lord of the Rings: The Two Towers, released a year and a half after The Spirits Within, and a triumph in exactly the ways that The Spirits Within failed. Ironically, for a film whose cast is so uniformly soulless, The Spirits Within is all about souls. The somewhat baffling story, freely mixing spiritualism and hard science in a way that feels quintessentially JPRG-ish (though the script, which was in English for maximum profit potential, was by Al Reinert & Jeff Vintar, the story was by Final Fantasy creator and series guardian Sakaguchi Horonobu, who also directed), is about the race of alien beings that have taken over most of Earth's surface by 2065, and assault and kill humans by eating our spirits. Which you can see as they're pulled out of our bodies, with your naked eye and all. Dr. Aki Ross (Ming-Na Wen) and her mentor Dr. Sid (Donald Sutherland) are busily working on a plan to fight these Phantoms by collecting eight elemental crystals alien spirits which will both cure Aki of her Phantom infection - the reason she's uniquely able to track down the target spirits - and help awaken Gaia, the spirit of Earth itself, to neutralise the Phantoms. Reluctantly helping them are Aki's former lover Captain Gray Edwards (Alec Baldwin), and his team of colorful soldiers, Ryan Whittaker (Ving Rhames), Neil Fleming (Steve Buscemi), and Jane Proudfoot (Peri Gilpin). And they have to work fast: they're being constantly stymied by the vicious General Hein (James Woods), who regards Aki's Phantom connection as proof that she can't be trusted, and just wants to blow the Phantoms apart with his giant space laser. It would be charitable to describe the film's storyline as mildly confusing: the mixture of random spirituality and space marine clichés results in an irreconcilable collage of ideas and tones that lurches from heady discussions of New Age arcana bolted to technobabble, right into noisy action sequences, and then into moody expressions of creeping horrifying dread. The way to get through it, I have found on two occasions now, is to stop wanting the story to click along normally, and just go with whatever seems to be happening onscreen in the moment; ultimately, it always comes back to Hein being wicked and Gray shouting out exposition and looking sidelong at Aki, and it's easy enough to parse that as a thoroughly generic sci-fi action adventure. "Get through it", I say, not "find it marvelously enjoyable". In faith, The Spirits Within always feels a bit musty and overfamiliar, it's just that its individually musty elements jar with each other in inscrutable ways. Which leaves us not with a particularly edifying story to sit through, but a series of visual spaces to watch unfold - it is a video game adaptation, after all. And fair's fair, the design of those spaces is absolutely exquisite. The film's evocation of a ruined Earth, turned into a literal alien graveyard, includes almost nothing but gorgeous backgrounds, full of hectically cobbled-together tech, flinty militarism, and an apocalyptic sweep in places. The Phantoms themselves are amazing-looking creations, translucent orange forms that flow and glide through the action with abstract beauty that offsets the inhuman horror of their design, which is usually spotted in brief snatches so that it never grows too comfortable. And yet, what is this marvelous world populated with? Plastic zombies. In an early use of motion capture, the human cast of The Spirits Within tends towards stiffness in their actions that clashes oddly with their elaborately detailed and free-flowing hair, but that's not really the thing that leaps out of the screen to devour your brain from the inside. For that, we needs must look instead to their faces, which are subtle horrors, but abiding ones. You'd not be able to pick it out in a still shot; other than the matte flatness of their eyes, these are photo-realistic creations. In motion, they are living nightmares. It's the skin, above all else: there isn't a millimeter of squash and stretch in the characters' exposed flesh, which doesn't stretch, or wiggle, or move at all - it's at its most obvious in something like the vein on Dr. Sid's scalp, which sits there, flat and cold and motionless, like an iron cord stapled to his head. But it's at its worst whenever a character moves their jaw, and their face gives way while their cheeks stay rigid and flat. It's so hideous that it almost doesn't even register that the mouth movements don't meaningfully line up with the spoken dialogue most of the time, so in addition to watching faces move the way faces can't, we're also watching mouths flap around like dead puppets being waggled by a monstrous and perverse unseen puppetmaster. I don't care how beautiful the design and compelling the world; and it wouldn't matter in the least if the story were a captivating masterpiece of curlicuing plot and piercing insight into the human condition. As long as the protagonists looked like that (Aki gets a bit more work put into her, but mostly at the level of texture and eye movement), The Spirits Within could never work as a motion picture. It is viscerally off-putting. The fascinating thing about it, is that for all that it horrifies me to watch more than a couple of minutes of it in a row, I am terribly glad the movie exists; it's like absolutely no other feature that I've ever encountered or even heard of, and its ambition is off the charts. This is the kind of severely disturbing dysfunction that only comes from pushing the envelope much too far, much too fast - all these years later, and we're still not caught up to the place where The Spirits Within wanted to get to in one step. It's absolutely one-of-a-kind, the perfect cinematic embodiment of Hunter S. Thompson's "Too weird to live, too rare to die", and in all its beautiful spectacle and skin-crawling ugliness, it is very much something that should be at least sampled, just for a taste of it. Because this film exists, we get to know what that kind of thing would look like; and better yet, because it exists, we know that we want to stay the hell away from that kind of thing, and why.